The primary way the Holy Spirit guides you is by reminding you what you’ve read in the Bible. That’s why we memorize Scripture. “Teach me, LORD, what you want me to do, and lead me along a safe path” (Psalm 27:11 GNT). It may seem obvious, but one thing that can keep you from knowing God’s will is not asking him about it. James 4:2 says, “You do not have, because you do not ask” (ESV). God knows the details of your life more than you do. So engage your “guidance counselor” by asking specific questions. He will guide you through your circumstances and feelings. Think about it: You don’t just have the guidebook, the Bible. You also have the author speaking in your ear. When you became a believer, God placed the Holy Spirit within you, and he’s been teaching you ever since to listen and respond to the Holy Spirit’s counsel. He knows every step of the journey and understands the blessings and dangers ahead. He knows where you’ve been and where you’re going, and he knows the best path to take. 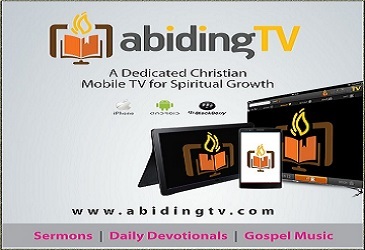 The primary way the Holy Spirit guides you is by reminding you what you’ve read in the Bible. That’s why we memorize Scripture. It stores his Word in our minds, and the Holy Spirit helps us remember. The other way God guides you is by impressions. God gave you a brain, and he wants you to use it. God will not control you; he’s given you free will. But he will give you an idea, and when you respond to it, he then begins to fill in the details. When God gives you an idea, that’s called inspiration. When the Devil gives you an idea, that’s called temptation. 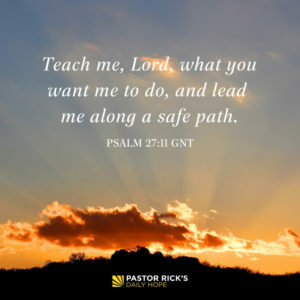 When you need to know the difference, ask, “Teach me, Lord, what you want me to do, and lead me along a safe path” (Psalm 27:11 GNT). What Bible memorization techniques do you use? If you aren’t memorizing any verses, what is one simple way you can start this week? Why do you think God wants you to respond to his leading before he fills in all the details of an impression? What is something you’ve needed but haven’t asked God for?